One of the things you need to discuss with your wedding DJ is the styles of music you want to hear. Having a favorite genre is fine, but if you want your wedding guests to have a great night, it usually calls for variety. 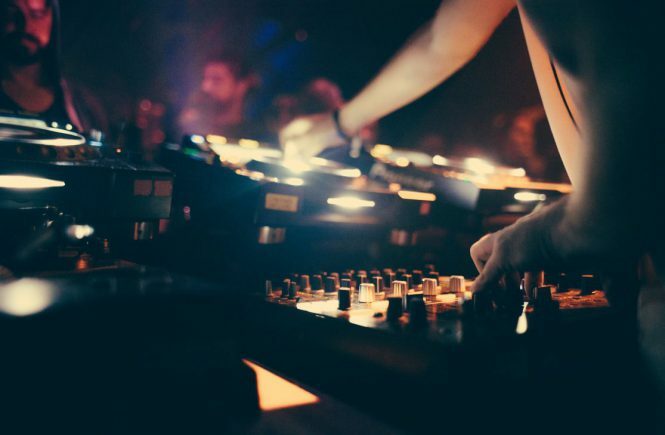 Here are a few genres you don’t want to forget if you are trying to ensure that everyone gets out on the dancefloor at least once. Latin music – From salsa to merengue, there are a lot of people out there who love to dance to Latin music, and you don’t have to be bilingual to enjoy the beat. If you are leaving this style of music off the playlist, someone on the guest list is sure to be disappointed. Swing music – The dance style that defined the roaring 20s came back with a vengeance in the 90s. 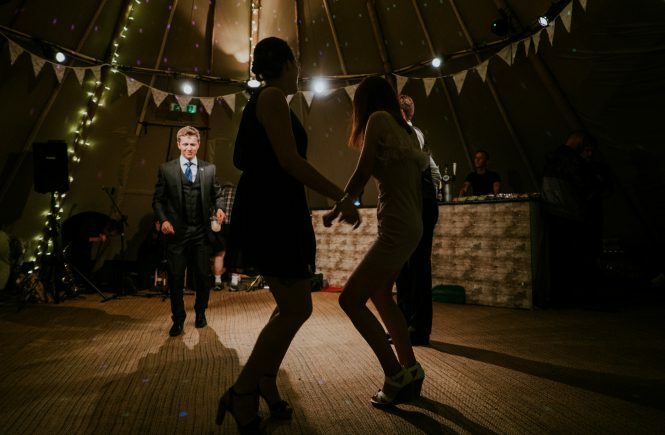 No one from that generation is going to be dancing to grunge rock, but if you play some swing music, you are sure to find out that some of your friends or relatives have been practicing for just such an occasion. Ballroom music – Ballroom dancing requires a little extra training, so if you’re pretty sure no one at your wedding knows how to foxtrot, waltz, tango, or cha cha, you may be able to get away without it. However, if you have just one couple who has a little training, everyone else is usually happy to get out there and give it a try, and it’s a great way to change up the pace. DJ Mikey Beats wants to be your wedding DJ. With experience as both a wedding DJ and a club DJ, you know you are getting professional sound equipment along with someone who knows how to comport himself at a wedding but also knows how to get people out on the dancefloor. To get started, call 858.270.2195 today, or you can request a quote online. DJ Mikey Beats has worked at major local venues like the Hard Rock Hotel in San Diego and the La Valencia Hotel in La Jolla. So wherever you intend to have your event, no venue is too big for Mikey’s professional sound equipment. Pro sound equipment is for more than just cranking out the jams when it is time to get everyone on the dance floor. You also want crystal clear sound for announcements, speeches, and even a formal ceremony. Whatever you need, just tell DJ Mikey in advance, and he will work with you. Just call 858.270.2195 or request a quote from the website to get the ball rolling. Then we can start working on your preferences in music or even come up with a custom playlist for your private event. You’ve waited your whole life for this, and now it is finally time to take your turn walking down the aisle to get married. While you may already have a procession song in mind, and there is nothing wrong with marching to the beat of your own drum, there is a reason why popular songs are popular. 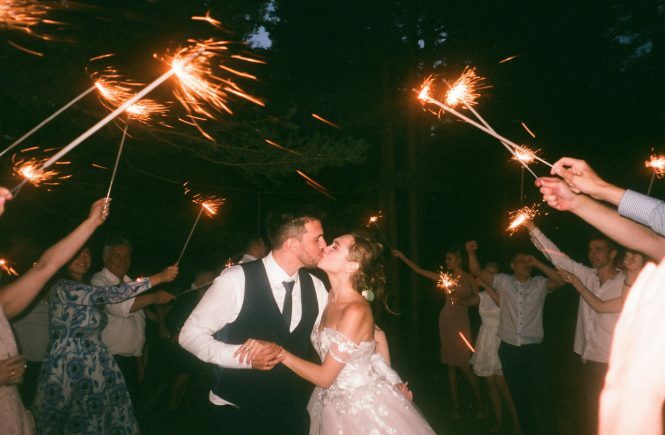 Here are some of the most requested wedding ceremony songs. The Beatles: Here Comes the Sun – Whether you get married in the summer or winter, you want to be the sunlight of your new groom’s life. Maybe that is why many brides choose Here Comes the Sun as their bridal procession song. For a nice twist on a classic song, you can try versions recorded by Daisuke Minamizawa, United Guitar Players, Vitamin String Quarter, or Stringspace. The Piano Guys: The Cello Song – Based on a Bach song that is considered one of the greatest cello songs of all time, The Piano Guys put their own spin on it by playing 8 cellos. Christina Perri: A Thousand Years – Everyone who gets married dreams of the bliss lasting forever. Maybe that’s why A Thousand Years feels so right when you are walking up to take your eternal vows. If you want a different spin on this modern classic, try versions by Boyce Avenue, Jun Sung Ahn, The Piano Guys, or Neena Goh. 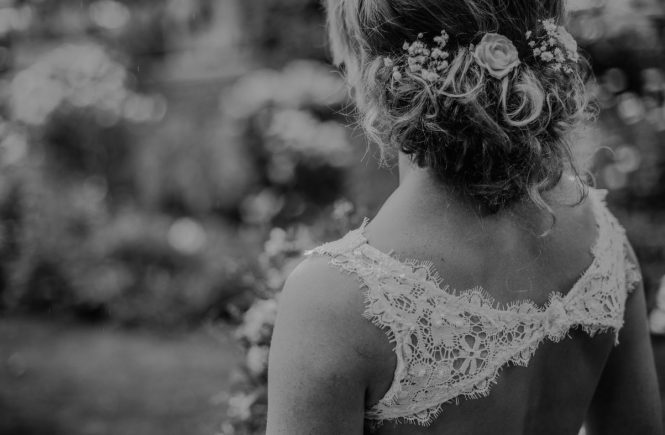 Pachelbel’s Canon in D – This is another classical tune that resonates with many brides, and there are plenty of exciting versions to choose from so you can maintain an original feel or something more modern. DJ Mikey Beats knows and has all of the top procession of the bride songs. No matter what your musical tastes may be, your wedding ceremony and reception need the right DJ, so call 858.270.2195 to book a true professional today, or you can get a quote online. Couples are always taking a look ahead when it comes to planning a wedding. What is in store when it comes to wedding music in 2019? One thing that may be about to catch on is more wedding music coming from soundtracks. This isn’t the first-time soundtracks have been a big deal in music. From Whitney Houston’s contributions to The Bodyguard soundtrack to Celine Dion’s My Heart Will Go On from the Titanic soundtrack, songs from movies and musicals have been played at weddings for years. What movies or shows are bringing back the trend in 2019? The Greatest Showman – Songs from this movie have been popping up all over, and with new renditions from popular artists emerging, the popularity of these songs won’t die down anytime soon. Bohemian Rhapsody – The Freddy Mercury biopic has brought Queen back into the spotlight. Guardians of the Galaxy – Making classic rock anthems relevant again has been just one of the accomplishments of this movie franchise. DJ Mikey Beats is a San Diego DJ with over 12 years of experience getting reception guests on the dancefloor. From classic hits to the latest trends, he has all the music you want and need at your wedding. To book your wedding entertainment, call 858.270.2195 today, or you can get a quote via the website. Are you planning a wedding in the San Diego area? 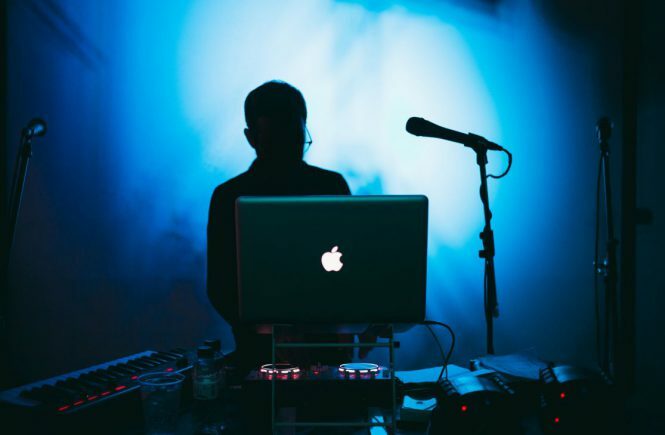 Here a few reasons that you need to hire a professional wedding DJ rather than relying on one of your friends to play music from his iPhone. 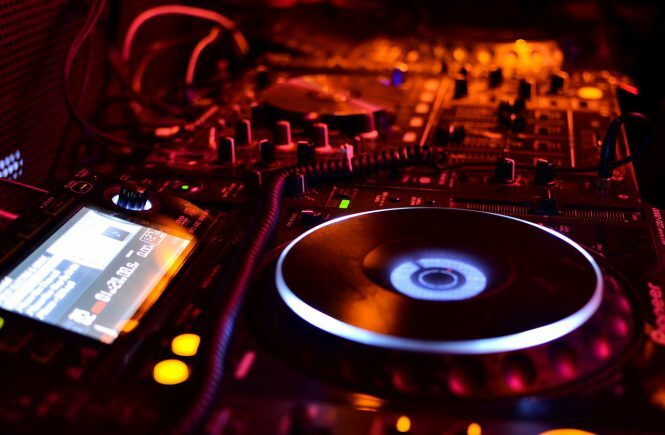 Selection – A pro DJ is going to have a ton of songs, especially all the best choices for getting people on the dance floor. 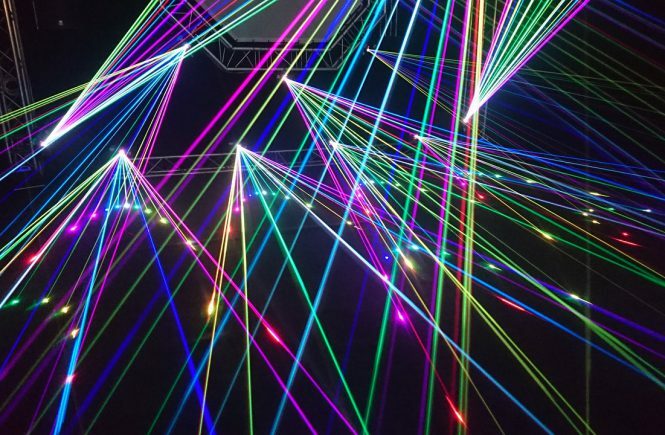 Ability – This is what a professional DJ does. If an amateur is dealing with a tough crowd, the party could be a total bust, but a pro will know how to save the evening. Equipment – Pros have professional equipment. You will get the right sound quality (not just volume) so that everyone can really enjoy the music experience. Professionalism – A professional DJ will dress appropriately for your wedding and will maintain the right decorum for you and your guests. The goal is to add to your special night, not to attract all the attention to himself. Peace of Mind – If you hire a professional, you don’t have to worry about whether things will be done right. It’s your big day – you shouldn’t have to be concerned with anything but having a blast with your family and friends. If you are planning a wedding in southern California, DJ Mikey Beats wants to help make your day even more special. To ensure the music goes smoothly on your big day and that everyone has a great time, just leave it to Mikey. Call 858.270.2195 to learn more, or you can get a quote online. The Dana on Mission Bay is a venue I typically am a wedding DJ at 3-6 weddings a year. Every time I show up, I am greeted by the staff with warm hand shakes and high fives. Adrienne who does the event sales and some coordination is my homie and she does a fantastic job. She is the perfect combination of fun and friendly but on point and hard working. Anytime we are on the same program, all will be executed to the fullest. 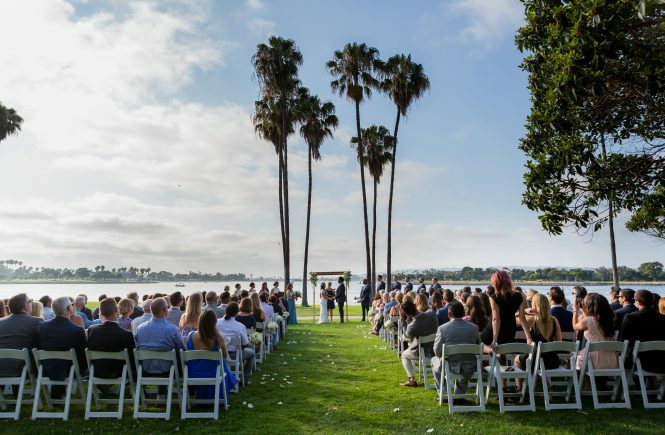 Roscoe and Erica picked a gorgeous bayside wedding venue, The Dana on Mission Bay. Wanting to have the dance floor packed with everyone having a great time was also on their priority list. 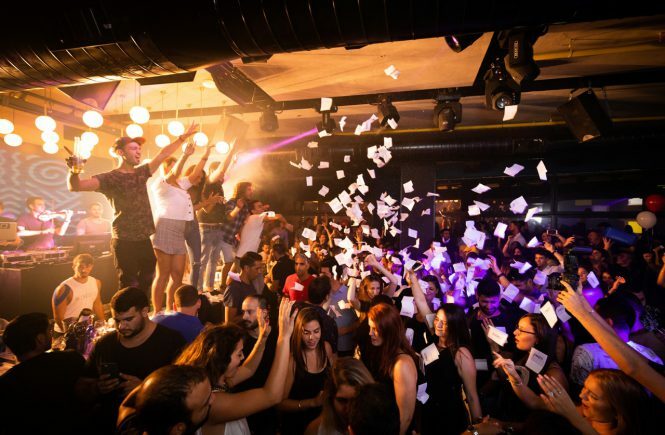 They also wanted to make sure that the Dj had club experience and could pay their preferred style of music. I was for sure up to the task. When they decided to hire me for my wedding Dj services I paid extra close attention to the music they wanted to hear. When we got down to the music selections Roscoe wanted to make sure that the music earlier in the day and night were geared towards the older crowd. Later in the night he wanted me to switch over to hip hop and newer music. Back when I started DJing, Hip Hop was the primary genre I played. I got very excited to drop some hip hop at this wedding. When I meet a couple who is having a Bali Hai Wedding, I know they are looking to have the island vibe wedding. Some couples want to have a destination wedding on an exotic island, but may not be able to afford it or the logistics are too much. A Bali Hai wedding for local San Diegans is a great way to inject that island vibe into a wedding. Rob and Tracey live in the north county of San Diego near the beach in Encinitas. Rob and his son love to surf. Tracey and her daughter love to hang out at the beach. Both were looking for a DJ who could lay down a beach soundtrack for their Bali Hai wedding. When we first met, their laid back San Diego personalities meshed with mine perfectly. They were looking for a good time and I was the one who would deliver it. 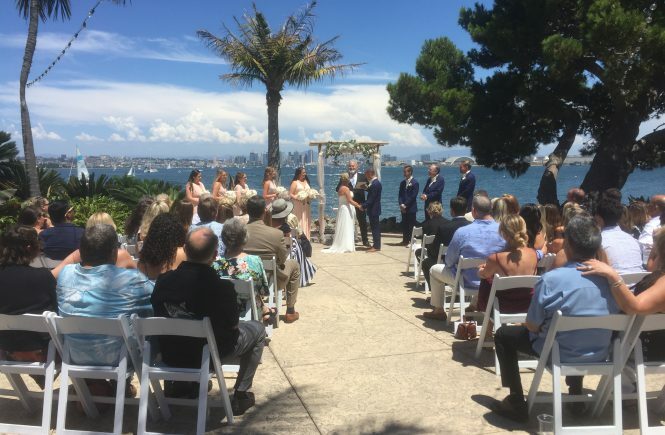 One thing that sticks out at a Bali Hai wedding is that the ceremony over looks the San Diego Bay. Across the bay on one side is the north side of Coronado island where the Navy base is. On the other side is a beautiful view of downtown San Diego. The pictures form these ceremonies are always gorgeous. The ceremony area is landscaped with tropical and lush palm trees and plants. The cocktail reception was held on the grass adjacent to the ceremony. The reception was in the Hawaiian Village. It was a day wedding and dancing did not suffer. My wife and I love DJ Mikey Beats who performed at our wedding last Saturday. Mikey Beats was a true professional from start to finish. Mikey Beats has been and continues to be the best DJ we’ve ever had at our events. We hope he sticks with us and we can continue to use him well into the future! !